Can Sarri arrest Chelsea slump? A fourth loss in 11 league games leaves Chelsea at serious risk of missing out on the Champions League for a second consecutive season for the first time since Roman Abramovich bought the club in 2003. Sarri’s men are still in pole position for a top-four finish, but now lead Arsenal and a resurgent Manchester United by just three points. Under Abramovich, Chelsea managers don’t tend to be given time if unsuccessful in their first season. 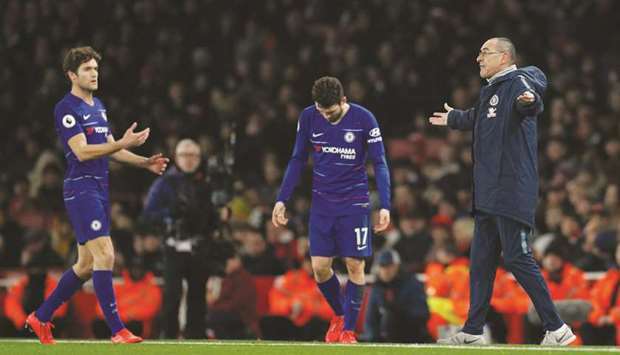 Sarri insisted he is still up for the fight, even if he accused his players of lacking the same heart. “It seems to me that, as a group of players, they’re not aggressive from a mental point of view. They don’t have a ferocity in their mentality,” said Sarri. Sarri does seem set to get what he wanted in the signing of Gonzalo Higuain on loan from Juventus for the rest of the season to offer some much needed firepower. However, while the former Napoli boss pointed the finger at his players, his tactics have also come under the spotlight in recent weeks. Chelsea’s early-season form owed much to the goals of Eden Hazard with Sarri claiming the Belgian was capable of scoring 40 this campaign. Instead, Hazard has just 12 as his goals have dried up since he has been wedged into a centre-forward role due to Sarri’s lack of faith in Alvaro Morata and Olivier Giroud. In keeping with their performances of late, Chelsea enjoyed 64% possession against Arsenal but had just one tame shot on target to show for it. Removing Hazard from his favoured position wide on the left of a front three has made it easier to crowd out Chelsea’s most dangerous player. Meanwhile, as Sarri demands more aggression, his most tenacious player, N’Golo Kante, is also out of position. Kante shone in winning back-to-back Premier League titles with Leicester and in his first season at Chelsea, as well winning the World Cup with France, as a relentless holding midfielder. Arsenal boss Unai Emery recently revealed the financial restrictions he is working under at Emirates with no money available to sign players on permanent transfers this month and was hoping for loan deals.